Since corn meal has no gluten (and is also very dry), use a ratio of about 40% corn meal to 60% AP flour. Combine dry ingredients. In another bowl, combine melted butter, milk, and egg. Add butter mixture to flour mixture; stir until batter is slightly liquidy and lumpy. Pour into ~ 8" x 8" metal baking pan. Grease pan or dump some vegetable oil in beforehand. Preheat oven to 425 degrees C.
Bake 20-25 minutes, or until toothpick in center comes out clean. Lastly, here's my take on a summer-y fruit salad/dessert. My dad loves eating avocado with a bit of lemon juice and sugar; it's a delightful cool treat to have on a hot summer's day. Not to mention the health benefits of eating avocado. 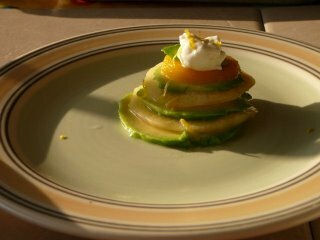 Set an avocado base, sprinkle with lemon juice, unrefined sugar. Layer with other fruits, and more avocado slices. Top with a bit of whipped cream, and lemon zest. Refrigerate about 15-20 minutes before eating. Well, I'd like to move back to Princeton to try this stuff!! !